5/35: We`re glad you`re here. 6/35: Enter into the kitchen. 10/35: Six Dining Chairs, Two Barstools and 4 extra chairs at the dining area. 15/35: Rainy Day or Evening activities. 16/35: Cozy up to the woodstove in the cooler months. 20/35: Natural light surrounds and fills the Paz y Pinos cabin. 31/35: Escape into your favorite read in the papasan chair. Bienvenidos! Welcome to the Paz y Pinos family cabin! Your whole family will have plenty of room to stretch in this four bedroom Blue Lake Springs home. Perched along the hillside, the expansive patio looks out over towering pines and cedar trees. Enjoy an outdoor meal cooked on the gas grill, or lounge outside under the electric awning while enjoying your favorite tunes from the MP3 dock sound system. You can enjoy some stargazing under the beautiful patio lighting or from either of the Juliette balconies from the upstairs bedrooms. In the winter months, cozy up to the wood burning stove in the living area. 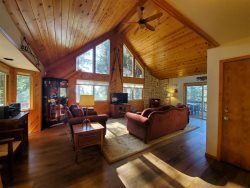 The Paz y Pinos family cabin has four bedrooms and two full baths (one full bath on each level). Enter the front door into the kitchen, flowing easily into the dining and living rooms. Bedroom one on the main level is a Queen bed. Upstairs are a King bed in bedroom two, another Queen in bedroom three. Bedroom four offers two sets of bunk beds, one with two twins and the other two doubles and a futon. Get your game on in the living room with a board game or the XBOX video game system. In the cupboards under the TV you'll find four binders, two full of XBOX video games and the other two full of DVD's.Travel back to the 80’s and 90’s because this XBOX system includes Super Nintendo and old school Atari games! In lieu of cable, enjoy streaming from your favorite apps such as Netflix and HBOGO via Amazon Fire Stick, please use your own login. In the summer between Memorial and Labor Day, guests will enjoy access to the Blue Lake Springs recreation center facilities which include swimming pool and lake, bocce ball, tennis, basketball and volleyball courts, a snack bar and many activities that vary daily. Guest fees are required with access. If the rec center is not your forte, explore nearby attractions such as Calaveras Big Trees State Park, the Arnold Rim Trail, Stanislaus River Access and National Scenic Byway Ebbetts Pass (Hwy 4 East). In the winter, enjoy a 30 minute drive to nearby Bear Valley Ski Resort or the Lake Alpine SNO-PARK for skiing, snowboarding, snowshoeing and snowmobiling. Please note that climbing stairs are required for entry to the cabin. Four wheel drive vehicles and/or tire chains are recommended for winter access as the driveway is up-slope. Driveways are plowed for your arrival, additional plowing at guest expense during your stay. Special Notes: Laundry area is not available for guest use.